Your tour leader is Maya Schlomka, an Ashtanga Yoga practitioner, who is currently training in Naturopathy at the Wingate Institute. Maya's tour will help you keep fit during your Ethiopian adventure. Daily yoga sessions, short cycling tours, and optional running sessions with Ethiopian Olympic-level runners will provide a fitness program for all levels. You'll visit a wide variety of local people, see some great natural landscapes and wildlife, and help the sports development of local disabled people. You'll assist Maya with a 3-session introductory yoga program for a group of deaf people through our local partner, Dires House of Sport. Part of your fee will help pay for yoga mats to be left with the participants. Your fitness level should be healthy. The daily yoga sessions can be accomplished by beginners to advanced levels. The level will be adjusted depending on the experience of the group. You arrive in Addis Ababa and will be picked up from the airport and transferred to the Orange Lion Guesthouse. If there is time you'll be taken on an orientation tour through the city. You’ll have a discussion and training review with your group leader regarding the yoga program that the group will use in the training of the youngsters during your volunteer work. You do not need to have experience in Yoga or training - only the willingness to learn and help. We start the day with an early morning Yoga session, either on the rooftop of the guesthouse or in the forest behind it. The forest is also a popular training circuit for Ethiopian runners. After the breakfast there will be an optional early morning short bicycle trip with a local Biking professional. Running training with a semi‐professional Ethiopian runner who competes internationally and who would be happy to train with you and introduce you to the lively Ethiopian running culture. Mid-morning we head into the city to the office of Dires House of Sport, our local partner in Ethiopia. Dires is a local charity ( NGO) that develops social & sport programs for people with disabilities. You will enjoy a traditional coffee ceremony and the director of the organisation, Mr Mulugeta Asmelash, will give a presentation about their work and ambitions. 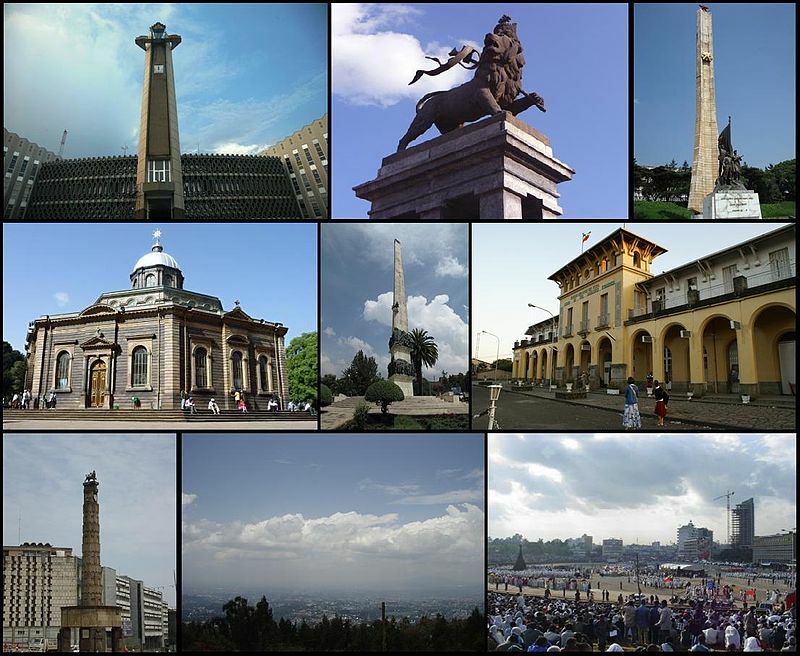 Then the group will explore the city of Addis Ababa. You will visit the national museum where you can meet Lucy, humanity’s common ancestor, and drink the best fruit smoothie of the city. The day will start with a sunrise yoga session on Entoto mountain, the highest point of Addis where you can enjoy spectacular views over the city. After a picnic breakfast you'll go to an Orthodox Christian church on the mountain and meet an Ethiopian orthodox priest who will show the group around the church. Then you'll head over to the Deaf School to conduct the first of three yoga sessions with the students. You'll assist Maya in introducing these youngsters to the art of Yoga. Lunch will be at the ‘sign language restaurant’, where most of the staff are deaf. The group will have a sign language translator along, who will also explain about the restaurant and its development. After lunch there will be an Ethiopian Dance and music workshop at the same location. Ethiopian dance is a great work out. One of the projects of Dires is a dancing group that consists of people who have physical disabilities. Under leadership of a famous Ethiopian dancer they have set up a dance group and they perform regularly in and around Addis. We have a talk with the dancers and they share their stories with us. Then they teach us some Ethiopian dancing styles and explain about the typical kind of music. After the dance workshop you'll go to a spa where you can enjoy a sauna/steam bath and a good shower. The day starts with an early morning Yoga session. After breakfast there will be an optional running training session or bicycle ride. Then we go to the school for the second session of your Yoga workshop. After lunch, we’ll visit Merkato, the largest and busiest market of Africa. One of the shopkeepers will walk around the market with the group. He is very familiar with the market and knows everyone. You will also shop for this evening's dinner which your group will prepare. Guests from the Dires Sport project will be invited, and your running and biking trainers. After early morning Yoga and breakfast, the group will conduct the third and final yoga session at the school. Then you'll leave Addis and drive south into the countryside towards the town of Shashamene, past some big lakes and beautiful aerial views. Lunch will be on the shores of Lake Langano, also a good place to take a swim. At the end of the day we arrive in Shashamene, known as a Rastafari enclave. Rastafarians are a highly spiritual group of people who worship the former emperor of Ethiopia, Haile Selassie I, as a divine being. Rastafarians from all over the world have settled in this town, which holds the largest Rastafari community of the world outside Jamaica. In the evening you will meet some of the Rasta community and they will give the group an introduction to their movement, philosophies and practices. There will also be an acoustic music session by one of the most distinguished musicians from the community. There will be two yoga sessions today. One in the early morning and another later in the day, in the forest. After breakfast you'll explore the ‘Rasta Village’ and visit the Nyabingi camp, the oldest and most orthodox Rastafari community. After we have enjoyed a (vegan) Caribbean lunch we go to Wondo Genet, an area of natural beauty not far from Shashamane. Emperor Haile Selassie loved to come here to meditate. Yoga session in the forest. The day concludes with a visit to natural hot springs where you can take a refreshing plunge. Very early in the morning, at sunrise, the group will go to the Rastafarian Bobo Shanti camp. The Rastas pray at sunrise and the group can join them and conduct the morning Yoga session there. Then off to Awassa, a town located at the shores of a lake with the same name. It is known as one of the most beautiful lakes of Ethiopia. There will be a boat ride looking for hippopotamus and crocodiles. You'll walk through the largest fish market of Africa and visit a monkey sanctuary. We can eat fresh fish for lunch and at the end of the day we return to Shashamane. In the evening we can relax with the Rasta community and share stories and experiences. After the early Yoga session and breakfast, the group will leave Shashamane and drive 4-5 hours to Arba Minch, a city in the very south of Ethiopia. There will be stops at scenic areas en-route. The Arba Minch area is known because of its tribal life. Dozens of tribes live in the area, each with their own language, culture, religion, etc. Before we enter the city we visit one of the tribes; the Dorze tribe. The Dorze tribe are famous for their weaving practices. We take a genuine look in their community, meet some people, and visit the weaving workshops and enjoy beautiful views over the area. After early morning yoga and breakfast, you'll visit the moringa farm of one of our Rasta guides, Ras Ibi. Moringa is one of those 'magic' foods and is rich with protein, calcium, vitamins, minerals and amino acids in much greater quantity than most plant foods. The leaves are cured, dried and ground to a fine powder that can be mixed with other foods. Ras Ibi will tour the group around the farm and explain all the lore about Moringa. After early morning yoga and breakfast, the group will drive about 2 hours to Konso. The 55 square kilometre Konso Cultural Landscape has been declared a UNESCO World Heritage site. It constitutes a spectacular example of a living cultural tradition stretching back 21 generations (more than 400 years) adapted to its dry hostile environment. The landscape includes stone walled terraces and fortified settlements that demonstrate the shared values, social cohesion and engineering knowledge of its communities. After early morning yoga and breakfast, the group will drive back north to Addis Ababa. The trip will take all day and will take a scenic route with a number of stops to view villages and the natural landscape. In the morning we organize a showcase event at the schools where you presented the Yoga workshops. The families of the children will be invited, in addition to local media, newspapers and possibly television, for a little publicity. The goal is to show Ethiopian society what the workshops were about and to demonstrate the relationships between local development and this type of participation from internationals such as your group. This will also help the development of our partner NGO, Dires. If you have an early flight then arrangements will be made to take you to the airport in a timely fashion. Those of you not flying in the afternoon will go to a traditional restaurant for dinner and enjoy Ethiopian food, dance and music. Then those taking the evening flight will be shuttled to the airport.